Fr. Peter was born in the Philippines on the 4th of July, 1960, to Catholic parents Pedro and Dominga Cordeno. He was ordained to the Priesthood on Sept 7, 1985, in the Metropolitan Cathedral of the Archdiocese of Palo, Leyte, Philippines. 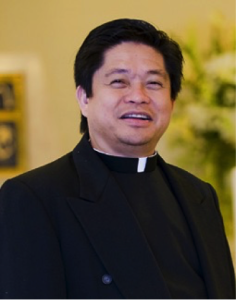 After serving for 20 years in the Philippines as Parochial Vicar and Pastor, Archbishop Thomas Wenski, who then was the Bishop of Orlando, in 2006, accepted him to be a priest in the Diocese of Orlando. On Apr 16, 2013, the Most Rev. John Noonan, the Bishop of Orlando, incardinated him into the diocese. On Sept 26, 2014, he took an oath as Naturalized American Citizen. Prior to Fr. Peter’s new assignment as Parochial Vicar at HNJ, he served at: St. Matthews Parish in Winter Haven, St. Maximilian Kolbe Parish, Orlando; Holy Family Parish, Orlando; Holy Cross Parish, Orlando and St. Mary’s Catholic Church, Rockledge.